Had a perfect stay in this nice hostel. The man from the hostel is one of the nicest and kindest person I have met, he made us feel really welcome. I would recommend this hostel to anybody! Best hostel ever. The rooms are clean, the bathrooms are clean. The chill area in the garden has a relaxing vibe and gives room to rest. The best of our stay was the staff. They drove us to the supermarket and even borrows us money, all to make our stay comfortable. We even got freshly baked pancakes as desert. The place has a lovely atmosphere as if you join a lovely family. I sure recommend this place to anyone visiting Skopje. 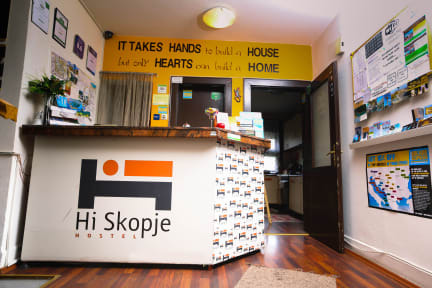 Had the best stay in Hi Skopje! The owner is the loveliest person, she'll arrange about anything for you. Facilities are great, they put great effort in keeping the place a home for everyone. Would 10/10 come back!